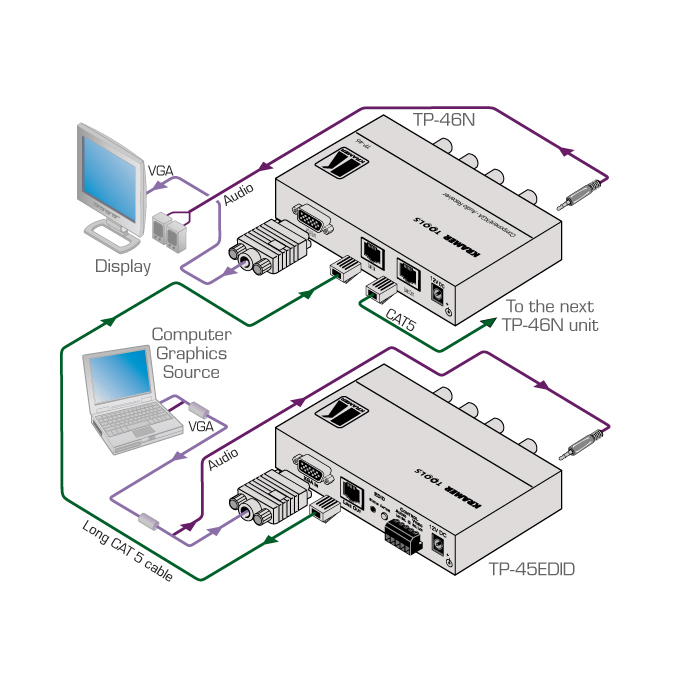 The TP-45EDID is a high-performance twisted pair transmitter for computer graphics or component video and unbalanced stereo audio signals. It converts the input signals to a twisted pair signal that it transmits to a compatible receiver. Max. Resolution - WUGXA (15-pin HD) & 1080p (component). Independently Selectable Video and Audio Sources - Computer graphics or component video, analog or digital audio. System Range - Up to 100m (330ft). Controls - Front panel input selector and EDID capture buttons, remote input selector terminal block. Indicators - Input selection and EDID status LEDs.